The HCSB Apologetics Study Bible reveals flaws in today’s bizarre worldviews while it helps you grasp the depth of biblical insight on each and every issue. More than 100 articles relate biblical truth to science, history, archaeology, psychology, philosophy, and other critical subjects. "How Apologetics Changed My Life!" by best-selling author Lee Strobel. Profiles of key historic defenders of the faith like Justin Martyr, Irenaeus, Anselm, Augustine, Joseph Butler, William Paley, Blaise Pascal, and C. S. Lewis highlight the clear-headed thinking Christians through the centuries have brought to bear on objections to faith. A generous helping of study notes clarifies the biblical worldview demonstrated in Scripture. The text is the remarkably accurate and inviting Holman Christian Standard Bible® translation. And features like book introductions, end-of-verse cross references, topical subheads, the words of Christ in red, and a detailed concordance make it simple to get the most from your Bible study time. 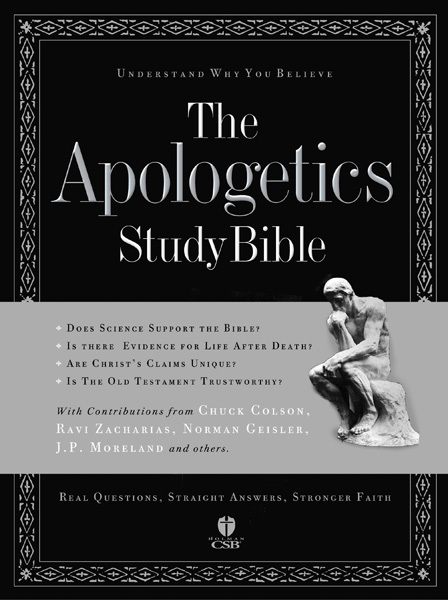 Philosopher and Apologetics Study Bible general editor Ted Cabal observes that we live "in the golden era of Christian apologetics." There has never before been so much scientific, archaeological, and historical support for the unique truth of biblical Christianity. The Apologetics Study Bible will open your eyes to new reasons to believe, a stronger commitment to faith, and better ways to witness for the Creator of it all. Feature note: The charts included in the print version of the Apologetics Study Bible are not currently available for the mobile version.